The other day, Violet tried to tell me, “I wan bah be a bomb.” I didn’t get it. I asked her to say it again, then again and again, and she was getting more and more frustrated. I turned to Daisy and asked what her sister was saying. Daisy sighed, “She wants to go to barbie.com.” I thought she was joking at first but when I turned back to Violet, she was nodding her head. How do you guys know about barbie.com? Daisy explained patiently, “We heard about it in a commercial. You can play games on it and dress up Barbie. It’s for kids. Can we use your computer? Please?” I told them NO WAY. I oh so gracefully vented something like this: It’s too late. You’ve made a mess and you’re not even helping me clean up. Daisy, you need to start your homework . . . and I don’t know why either of you would be expecting to go on my computer when you don't take care of your own things! “Please?” NO! The main problem is I don’t want the kids using my laptop, which is the only reliable computer in the house. I just got it last spring – I’ll be making payments on it for the next couple years – and there’s already been a freak accident. I was on the laptop when Violet tripped from several feet away and somehow splashed an entire glass of lemonade into the keyboard. The keyboard was pretty messed up, so Dell sent me a new one that I had to install myself, and ever since then, there is a panel around the keyboard that won’t snap down all the way. I really don’t want to let Miss Wear and Miss Tear have their way with it. After thinking it through, I realized that barbie.com is an opportunity for young fans to improve their literacy and eye-hand coordination. So last night, I set the kids up. The first game involved using party favor bags to catch items falling from the sky, such as lipsticks and cupcakes. After the first round, Daisy rubbed the initial scores of 600 and 0 in Violet’s face. Violet took it pretty hard but we cheered her on to a score of 400 in the next round. Their favorite activity, however, was styling Barbie Fairytopia – from her hair to her wings to her shoes. After about an hour, I shut it down but it was like taking crack away from an addict. The kids, all crazy eyed, wouldn’t let go of the laptop and I had to literally pry their sweaty hands away. So I made the Barbie heads an offer . . . they can earn computer time by helping me clean up. Violet got to work right away, enthusiastically singing the clean-up song Daisy and I have been trying to teach her for the last year. I explained that they were earning credit for tomorrow as they already had a turn and it was almost time for bed. But bedtime would not deter Violet's devotion. At 4 a.m., Violet woke me up with “I wan bah be a bomb ri now.” I sent her back to bed. She came back at 6. I sent her back to bed again but it didn’t stick. 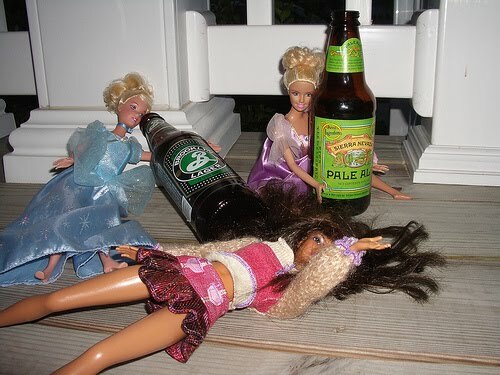 Maybe I should have thought this barbie.com thing through a little more. Thankfully, they’re at daycare now so it's peaceful. But soon, it will be time to get pumped for the negotiations at pick-up time.